Centrally located bach within 5 mins walk to beach, shops, estuary/playground and tennis courts. Quiet, ROW property with carport and utitility that includes extra toilet and shower. Great open plan kitchen, dining room and living area for families and entertaining. Bi-fold doors open out to a lovely private courtyard with picnic table and beautiful tropical gardens, perfect for relaxation after a day at the beach. 2 bedrooms also have ranch slider access to courtyard. Flat screen TV in lounge with freeview dish (BYO mysky card for sky channels), addition freeview TV in kids room that also takes Skycard. Stereo and DVD player. Books, toys and board games for the kids also available. Fully fenced with parking for around 4 cars. The house has everything we needed, is spotlessly clean, and has the best location. Close enough to beach to walk down with longboard (especially if the bar is working!) and easy walk to shops and cafes. Bach was nice and clean and smelt great ..easy to clean on departure and had everything that you need . Great location, great facilities and space. Would definitely stay again. We thoroughly enjoyed our 5 nights here. Having the two bathrooms and an outdoor shower to wash the sand off was great. The location is great - being so close to the wharf and to town. The rooms were spacious. The only draw-backs were the 4pm check-in on day one it would have been great to have checked in at 2, and the bunk beds were quite squeaky - one of the kids chose to sleep in the lounge instead. Overall all though it was a great place to stay. Lovely breezy place to stay, easy to clean floors, close to everything and plenty of bathroom space. Bach is in a great location close to beach, estuary and town. 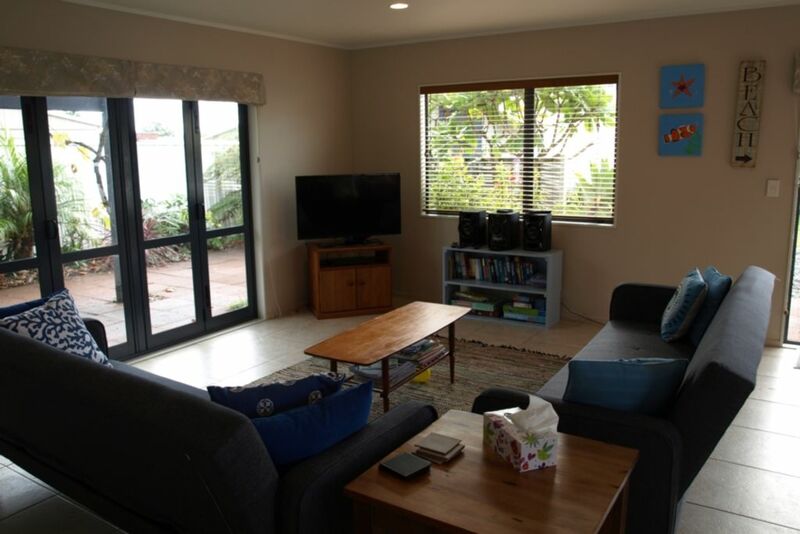 Bach is in a great location close to beach, estuary and town. We were very comfortable during our stay. Great location to boat ramp, town and beach - comfortable, and met all our needs.